WINSTON’S Wish, the leading charity for bereaved children, joined hundreds of troops at Gloucestershire’s Imjin Barracks for a hearty breakfast as part of a Guinness World Record attempt. Doug Herbert, Quarter Master Sergeant Instructor, got proceedings underway as the group attempted to crack the “most people dipping egg soldiers simultaneously” record. The QMSI instructed the assembled troops to have their toasty soldiers at the ready, shouting out the orders to commence dipping at 10:00am. Eggs, donated by Creed Foodservice, were softly boiled by the catering team at the barracks and the bread kindly donated by Waitrose was toasted. 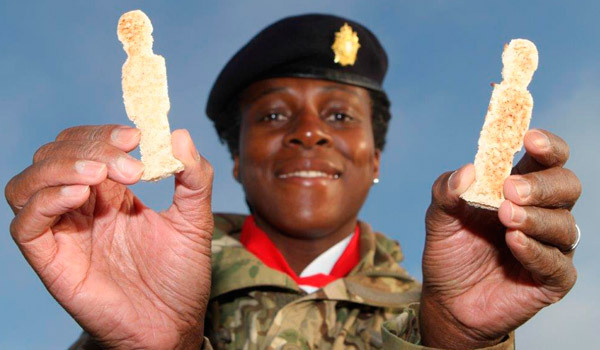 179 soldiers took part and were celebrating after consuming their eggy breakfast by receiving a Guinness World Record attempt medal. The event was staged to launch The Winston’s Wish Great British Brekkie fundraiser taking place during the week beginning 10th February 2014. The campaign invites members of the public, together with family, friends, colleagues or classmates to join Winston’s Wish to help raise £50,000 to support bereaved children by hosting a charity breakfast in February. Doug commented: “The soldiers taking part today in the Guinness World Record attempt were delighted to be asked to support Winston’s Wish. 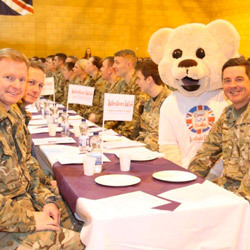 Catherine Ind, Chief Executive of Winston’s Wish, added: “It has been wonderful to have the support of the soldiers from Imjin Barracks in our World Record Attempt to launch our Great British Brekkie fundraiser. Winston’s Wish has been offering a specialist service provision for bereaved children of military families since 2011 thanks to funding from Help for Heroes. The funding from Help for Heroes enables any military family across the UK with children aged 18 or under affected by the death of a sibling or parent to access a full programme of support provided by Winston’s Wish. For more information about the Great British Brekkie and to register, visit www.greatbritishbrekkie.org.uk or tweet Winston’s Wish @winstonswish using #greatbritishbrekkie.